After the Battle of New York, Natasha Romanoff returns to work as an Agent of S.H.I.E.L.D., reacting to threats around the world, often alongside Captain America. 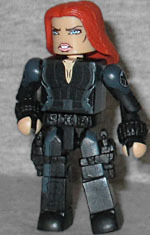 Black Widow has had more Minimates based on the movies than she's had based on the comics - if you count the Natalie Rushman figure, this was the fourth, and a fifth came out with Age of Ultron. This one gets the straight hair she had during Winter Soldier, and the way her torso is painted really does a nice job of faking anatomy. Her bracelets are new molds, but her holsters and guns are reused. For some reason, they opted to make her look super angry. Captain America's newest friend, Army veteran Sam Wilson was given a set of wings that made him smaller and more maneuverable than a fighter jet. Isn't everybody smaller and more maneuverable than a fighter jet? I know I am. You probably are, too. We're not as fast as a jet, but we move around better. Falcon's wings are a cool new piece - or more accurately, series of pieces. He has a black and silver harness that includes his jet boosters, then bits that fit over his upper arms to hold the wings, which themselves have a swivel joint in the middle so you can bend them. Those "bits" are supposed to be shoulder pads, but they're only in the proper spot when you've got his arms spread wide (naturally). 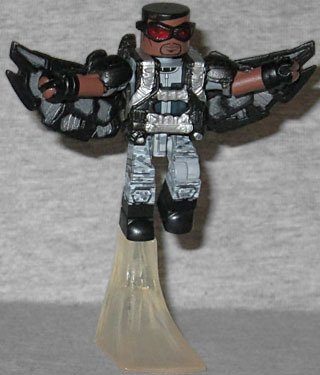 If you want a Sam Wilson instead of a Falcon, you can do that, too: the wings, harness, and even his goggles all come off. Yes, removable goggles. On a 2¼" tall figure. That are held on by nothing other than friction, and are molded in red so his eyes can be seen through them. That's cool! He's got grey camouflage pants with painted kneepads, and his short-sleeved jacket is two tones of grey, just like he wore in the film. 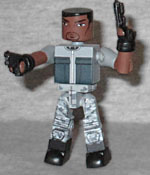 He comes with a pair of pistols originally seen with Chris Redfield, though in the film he carried Steyr SPPs. And of course, so the Falcon can fly, we also get a one-footed flight stand. This entry was posted in Art Asylum, Marvel, MMMR and tagged Black Widow, Captain America, Minimates. Bookmark the permalink.